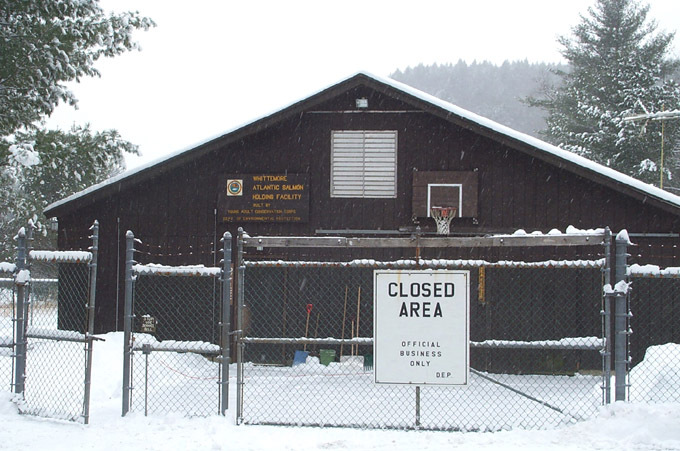 The Whittemore Salmon Station is closed after 22 years of operation at its location in Peoples Forest on East River Road in Barkhamsted. 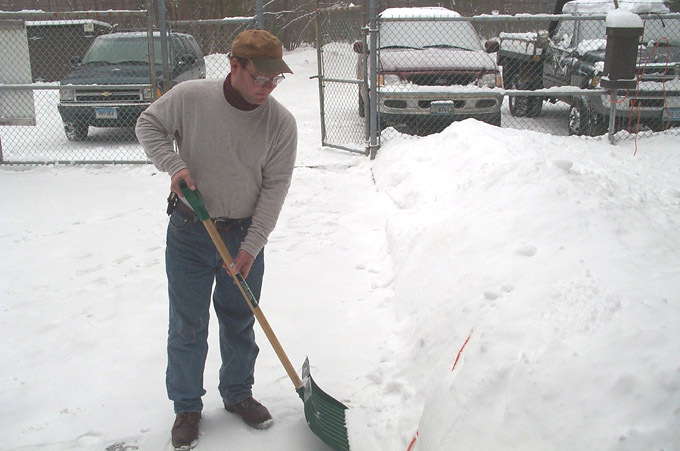 The Connecticut Department of Environmental Protection announced the decision in December 2003 and now in January 2004 the facility is relatively quiet as DEP employee Joe Ravita works to mothball the building. There are no plans to demolish the facility at this time. The decision was reached based on a lack of funding. At the time of closing there were 229 salmon at Whittemore, which were transferred to other salmon facilities. If funding becomes available in the future the Whittemore facility could possibly reopen. Joe Ravita has been a full time DEP employee since 1987, and has lived and worked at the Whittemore location during that time. He will continue to live here as a caretaker, however most of his time will be spent at State hatcheries in other locations. 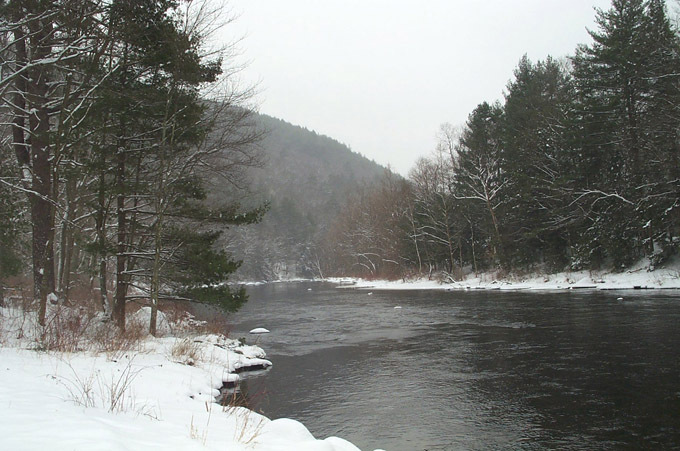 The effort to restore Atlantic salmon to the Connecticut River and its tributaries is still an ongoing effort, if somewhat reduced in scope because of funding cutbacks. Photo above- The Whittemore Atlantic Salmon Holding Facility closes after 22 years of operation on East River Road in Barkhamsted. Photo above- DEP employee Joe Ravita will still spend some time at the Whittemore facility in a caretaker role. The Whittemore Station was used to hold adult Atlantic salmon that had returned from the ocean. The salmon had been trapped in the fish ladder at the Rainbow Dam in Windsor, and were held at in tanks at Whittemore that simulate the environment of the Farmington River. Salmon captured at fish ladder at Leesville Dam in East Haddam also came to Whittemore. 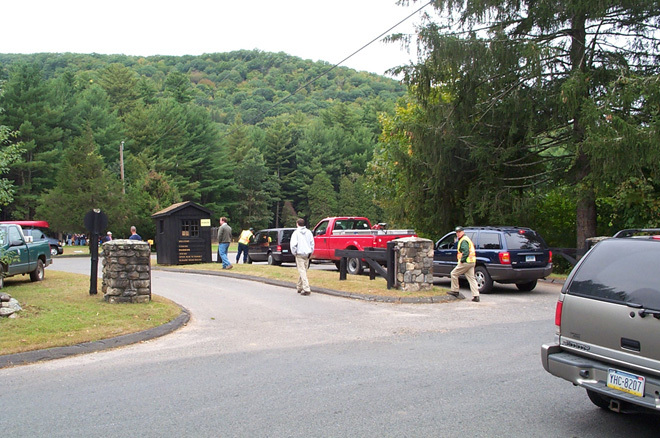 The wild salmon were not brought to other fish hatcheries in Connecticut because they could potentially harbor pathogens that could endanger other fish at those hatcheries. So they were segregated at the Whittemore facility. After spawning at Whittemore, the eggs produced by these salmon were transferred to hatcheries located in the four Connecticut River basin states (Vermont, New Hampshire, Massachusetts and Connecticut). 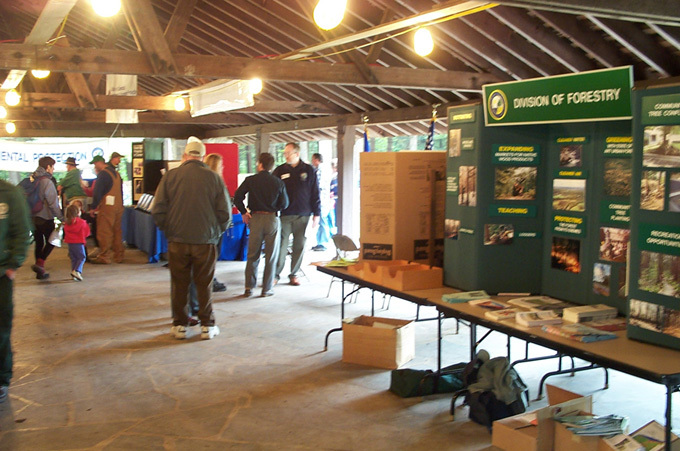 Looking just at the Farmington River portion of the salmon restoration effort, the program was meeting with success up to about 1997. Each year a good number of salmon were returning to the Farmington. In 1997 there were 60 salmon counted at Rainbow Dam, in 1998 there were 50. After 1998 the numbers started to fall off dramatically, with 6 in 2001, 4 in 2002 and 2 in 2003. Salmon seem to do well in the Farmington River and appear to migrate out to the ocean in a normal fashion. The problem occurs in the ocean and the push now is to try to figure out what is going on at sea. Possibilities include changes in ocean temperature (the polar ice caps are melting and this could be lowering ocean temperatures) or an increase in predators such as stripped bass. Photo above- The Whittemore facility on a cold day in January, 2004. Photo above- Looking down stream on the Farmington River, Barkhamsted, just north of the Whittemore Salmon Station (January 2004). 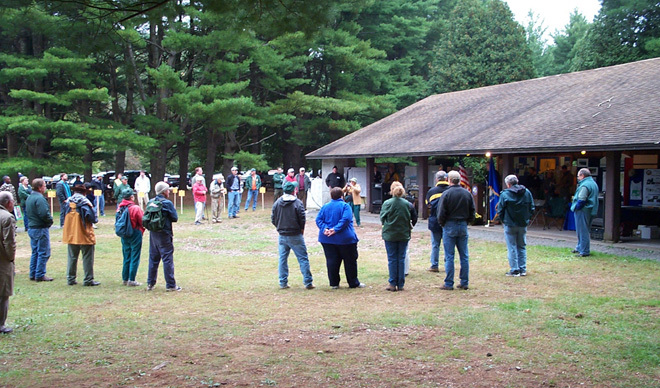 Let's take a quick tour of the Churches in Barkhamsted, what they are up to in December 2003, their pastors, and maybe just a wee bit of history. 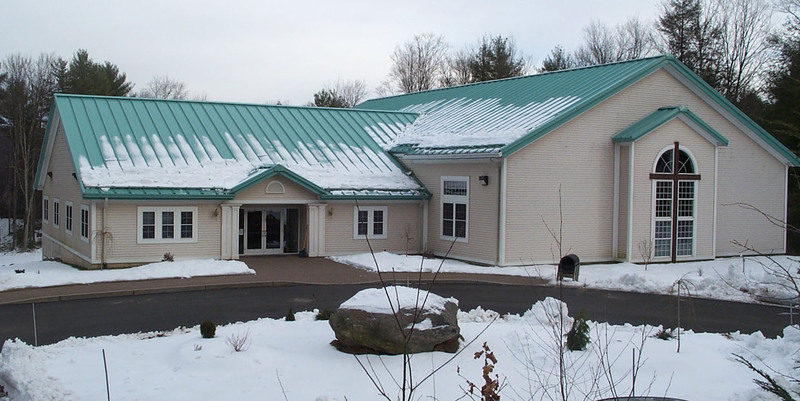 Barkhamsted's newest church, Praise Christian Fellowship was built in 1998 and is located on Route 44 about a half mile south of the Log House Restaurant. The congregation, of the Lutheran faith, was started in 1986 and held services in the West Hartland Library for several years. Praise Christian Fellowship on Route 44 in Barkhamsted. 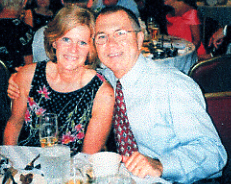 Pastor Warren Geraghty and his wife Cindy. In 1988, Pastor Warren Geraghty was brought in from Montana (Pastor Garaghty is originally from Rhode Island) and is currently serving the Church. In December 2003 the Church has 60 members with an average of 160 people attending services each Sunday. Members are accepted after attending Church services for 12 months, attending pastor class on Sunday for eight to ten weeks covering the values of the Church and also meeting personally with Pastor Geraghty to cover additional topics on spirituality. Pastor Geraghty feels strongly that members should be challenged and encouraged to grow spiritually. In March the Church is launching a focused and structured plan to do just that, offering a five year program starting with the basics and progressing through to learning principles to apply for the rest of your life. The new Church building is a wonderful facility and includes a spacious sanctuary with modern visual aids, fellowship hall, children's room and a large indoor basketball court! The Church offers a number of programs for children, teens and adults. One project currently being looked at is the establishment of a radio station offering Christian music targeted toward younger people. The Pleasant Valley Methodist Church congregation formed in 1838 and met in area homes until the Church was built in 1848. An addition was built in 1899 and a major addition in 1992. 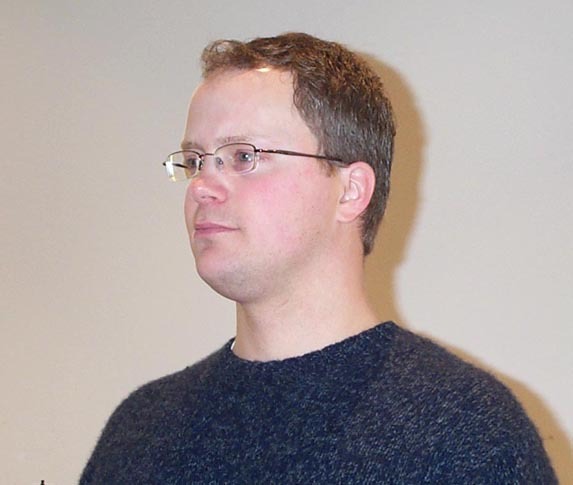 The current pastor is Timothy Hare who has served since June 2000. 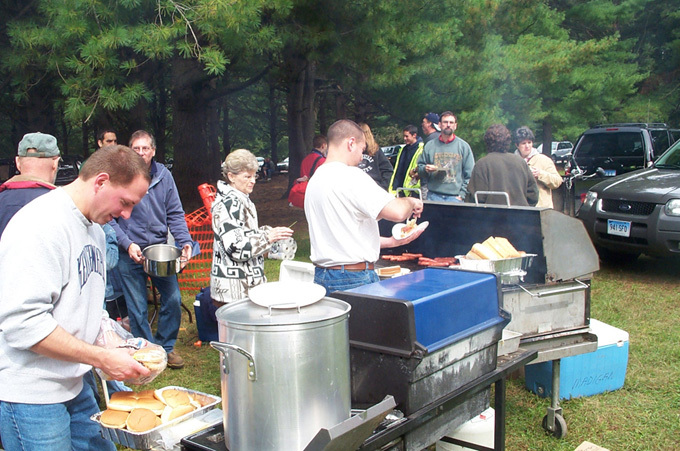 In December 2003 the Church has 278 members and averaged 140 in attendance at the single Sunday 10:00 a.m. service. Route 181 in Pleasant Valley. pastor at Pleasant Valley Methodist Church. Currently the Church is involved in a capital campaign to raise about $70,000 for steeple repairs, exterior and interior painting, a new organ and repairs to the parsonage (located on Raymond Drive in Barkhamsted). Volunteer workers are now finishing up renovations to a portion of the Church (what was once the old store building) to convert one big room into three rooms including an office/meeting space, kitchen and bathroom. Member volunteers also operate an extensive food bank in the Church basement using food donations from the congregation. The food bank is open on Mondays and Thursdays to people from Barkhamsted and New Hartford. 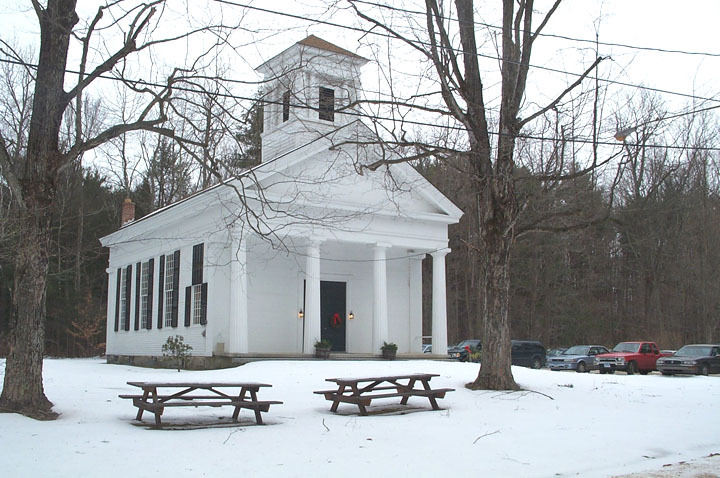 The current Church at Barkhamsted Center was built in 1845 to replace the old meeting house that was located on what is now Metropolitan District Commission reservoir land. The Church completed a community room basement addition in 1976 and a major interior restoration was started in 1990. The Church currently has 62 members and average attendance in December was 29. One 10:00 a.m. service is held each Sunday. Robert Decker of Rocky Hill has served as the interim pastor since January 2002 while a search for a permanent pastor is being conducted. pastor of the 1st Congregational Church. The congregation supports a variety of charities including support of a child in a third world country through Church World Vision and an annual blanket drive. Food is also collected and given to a Winsted food bank. 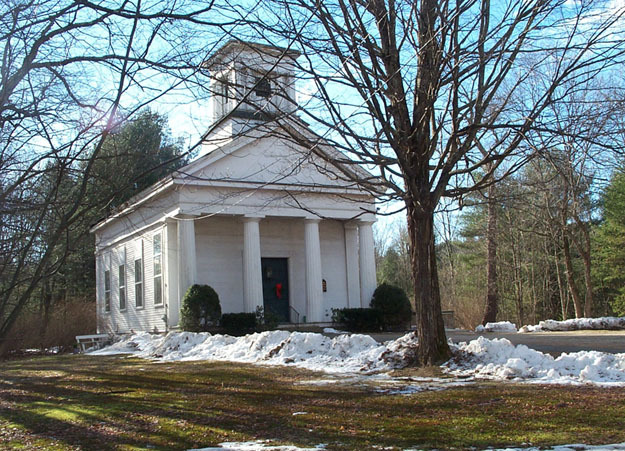 The Riverton Congregational Church was built in 1843. 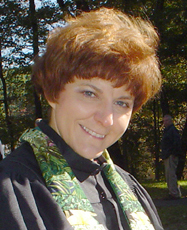 Denise Clapsaddle has served since December 2002 as the acting pastor for the Church, and she is expected to be confirmed as the permanent pastor. Currently the membership totals 85 with average of 26 attending the single 10:00 Sunday service. Riverton Congregational Church, Riverton, CT.
pastor at Riverton Congregational Church. The congregation is now involved with a fundraising effort to cover the cost of needed building repairs to the roof and exterior trim. Church leaders are also looking at ways to play an increasing role in the Riverton community. The Church has been involved with a variety of Christmas events including hosting the Christmas Carol put on by the Riverton Theater group, a children's Christmas Pageant and Christmas caroling in Riverton. The Washington Hill Methodist Church on Route 219 still has services periodically during the year. A nasty little rain and ice storm cancelled the scheduled Christmas service for December 21, 2003. A service was held here in November on the eve of Thanksgiving. The church is associated with the North Canton Community United Methodist Church, whose pastor conducts the services here at Washington Hill. The church was built in 1834 with bricks from the nearby brickyard of Truman Case. The photos below show examples of the new dry hydrants installed last year to augment the progressive fire fighting water supply for our town. These new standpipe, of which there are thirteen, were installed with the help of federal matching funds via the State Department of Environmental Protection Forestry Division. 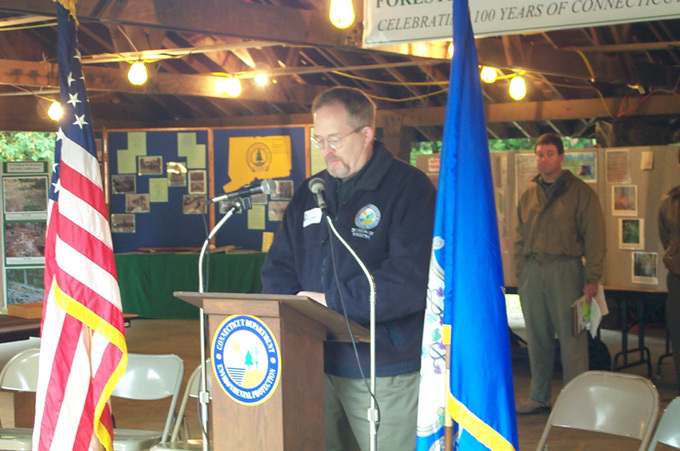 Local residents and State Forest Protection Program Specialist Ralph Scarpino helped with the approval of the sites. The town's elected Fire Commissioners provided $20,000 of front money for the program, not all of which was needed when coupled with the federal grant money. The cost per installation ranged from $500 to $4,000 and the 50% matching funds paid by the Forestry Division was good up to a $1,000 maximum. The paperwork involved in this program was extensive and required grant applications and inland wetland permits for each site. The town's three fire chiefs signed the grant application and Fire District President Richard Winn signed all the permit applications. Marquam Johnson, Barkhamsted's only fulltime fireman, was responsible for filling out the applications and also worked at the sites installing the standpipes. Scott Hoskins, of the Hoskins Excavating and Trucking Company, was a highly skilled backhoe operator who dug the trenches, most times under water and out of sight, to place the PVC pipe. Town highway crew and equipment helped in the joining and covering of the six and eight inch PVC pipe and strainer. 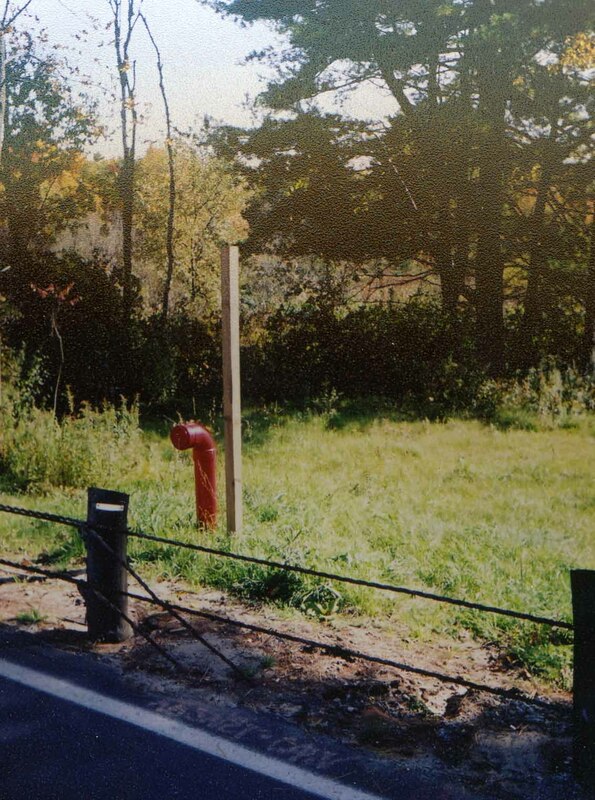 Whereas none of the new standpipes has been used to directly fight a structure fire, they have been used to refill pump and tanker trucks on several occasions, and are used for training drills regularly. The thirteen dry hydrants significantly increases the fire protection resources in Barkhamsted by improving water accessibility and reducing refill time during emergencies. 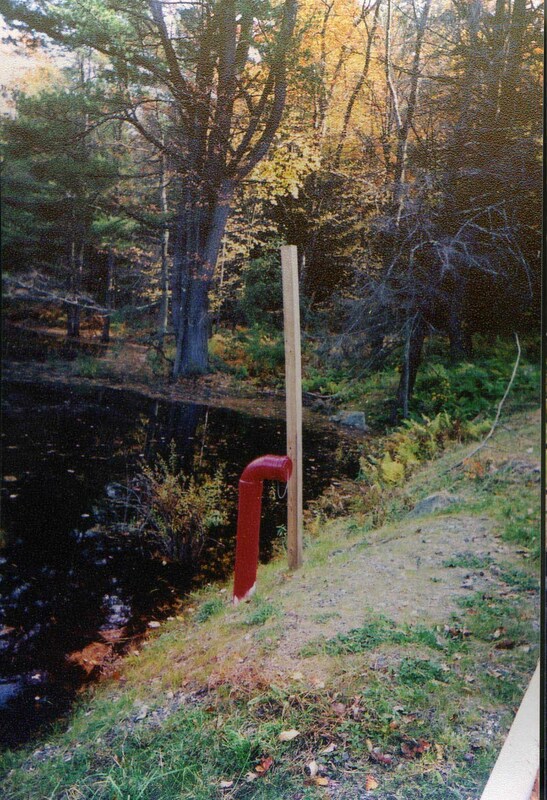 Photos above- two of the thirteen dry hydrants installed at pond and stream sites throughout Barkhamsted. The photo on the left is near the intersection of Route 219 and Ratlum Road. It is amazing how many cars cross the Saville Dam in Barkhamsted each day. Route 318 is very busy even during the middle of the day, well after morning rush hour has come and gone. It is pretty safe to say that most of the drivers, including those in a hurry, admire the beautiful scenery as they cross the dam: the Barkhamsted Reservoir framed by mountains to the north and Lake McDonough to the south. But on this day (Monday, September 22, 2003), one thing hidden from the view of the passing traffic is a large lawn tractor slowly traversing the face of the dam mowing a huge expanse of grass there. Photo above- mowing the grass on Saville Dam. This top section of the dam is the steepest portion and the most difficult to mow. 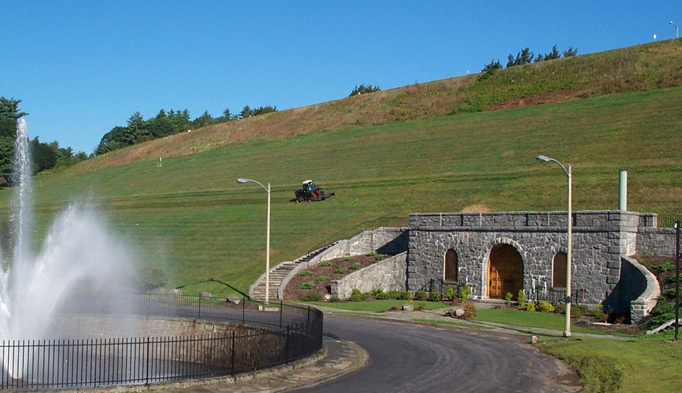 The Metropolitan District Commission (MDC) maintenance crew based at the building on Beach Rock Road is responsible for maintaining the area around the Saville Dam, including the mowing of the ten acres of grass on the face of the dam. The grass on the dam is cut about once a month. Today, MDC employee Chris Zern is starting at the bottom of the dam and working his way up. There are three sections to the face of the dam, and Chris will mow the bottom two sections today and finish the top section later in the week. It takes about a half day to mow the bottom two sections. The mowing job is slow despite the 90-inch swath cut by the large diesel powered Power-Trac mower. Each quarter mile run across the dam face takes almost 10 minutes to complete. But what makes this job a challenge isn't just the large amount of real estate involved but the angle that has to be dealt with. The face of the dam is steep. The grade of the top section is about 40 degrees. Dealing with angles this steep requires specialized mowers. The Power-Trac mower is designed with a low center of gravity and dual wheels to increase stability. Chris will use the Power-Trac on the bottom two sections, which are not quite as steep as the top section. To mow the top section he uses a slightly smaller mower, the Kut-Kwik, which cuts a 72 inch swath. Either mower is capable of cutting the top section but with nine years experience, Chris has found that the smaller mower works better there. The large Power Trac mower can barely be seen at the center of this photo on Saville Dam. Those gray specks above and to the right of the mower are Canada geese eating breakfast. Chris does most of the mowing on and around Saville Dam. This mowing job in September will be the last one for the season. The first mowing is done in May. Actually, Saville Dam is just one of several dams that Chris mows. The others include Goodwin Dam in Hartland (near the Colebrook town line), the Phelps Brook Dam on the Nepaug Reservoir in Burlington, the Reservoir Six dam in West Hartford and the dam at the West Hartford filters. Mowing all these dams takes about two weeks including rain days. 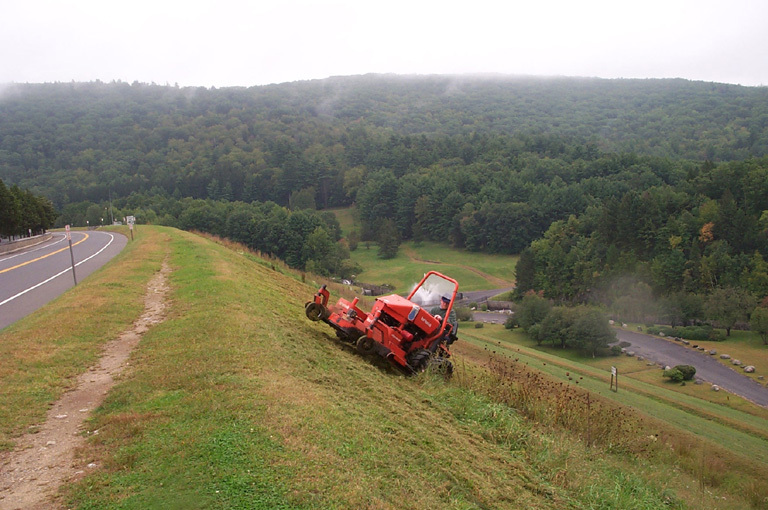 With the new modern mowers, the work on the steep faces of the dams is made somewhat easier. 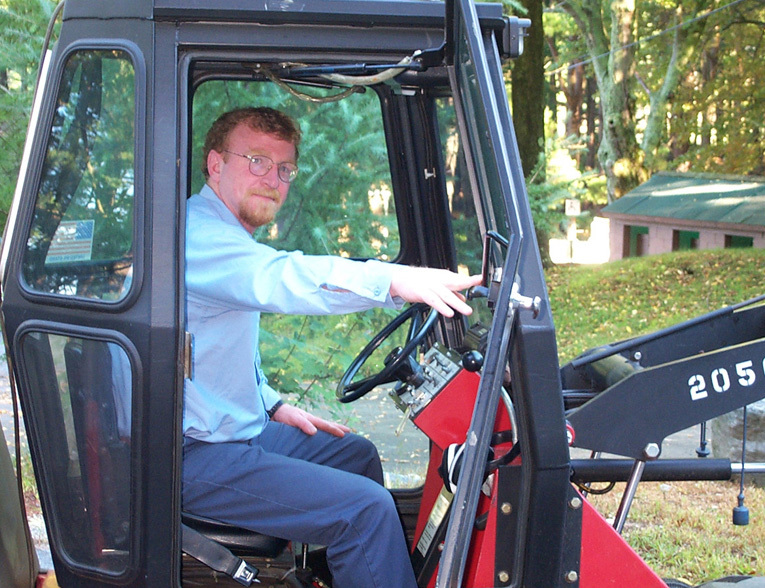 The MDC has had Kut-Kwik mowers since the mid 1980s and purchased the Power-Trac in 1998. The Power-Trac has a variety of attachments that allow it to also spread fertilizer and remove snow with a snow blower. In the "old days" before the mid 1980s, a gas-powered walk behind mower was used to mow Saville Dam. 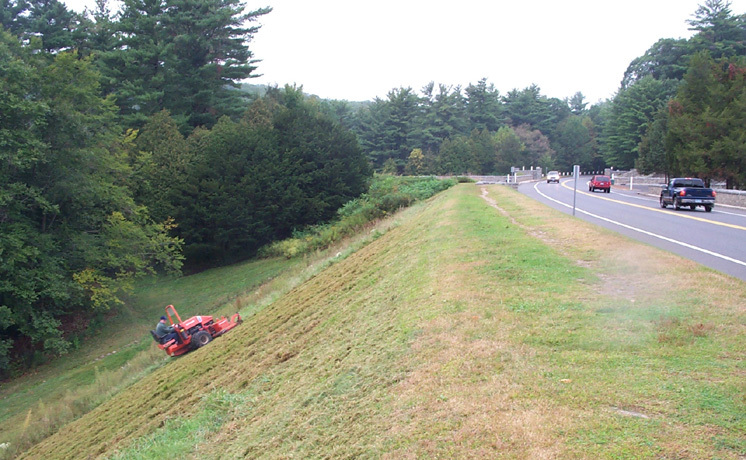 The mower was not the best on the steepest part of the dam face. The work on the steep top section was very difficult and involved two people. One person operated the mower and another pulled on a rope attached to the mower to keep the machine from tumbling down the dam. Before that a variety of different methods were used on the steep top section. At one point the grass and brush there was allowed to grow and it would be periodically burned off. Shrubs were also tried: the top section was planted with juniper so that mowing would not be necessary. But State dam inspectors would not allow shrubs on the dam and they had to be removed. 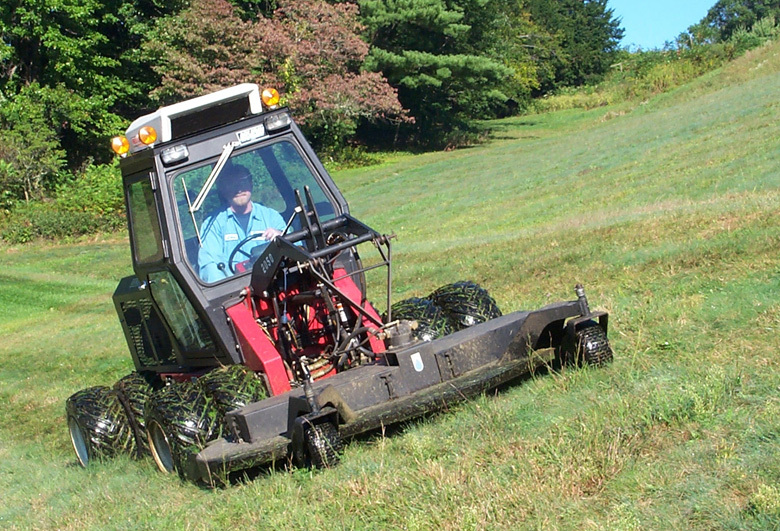 The Power Trac mower is diesel powered, has a low center of gravity and dual wheels for steep slopes. 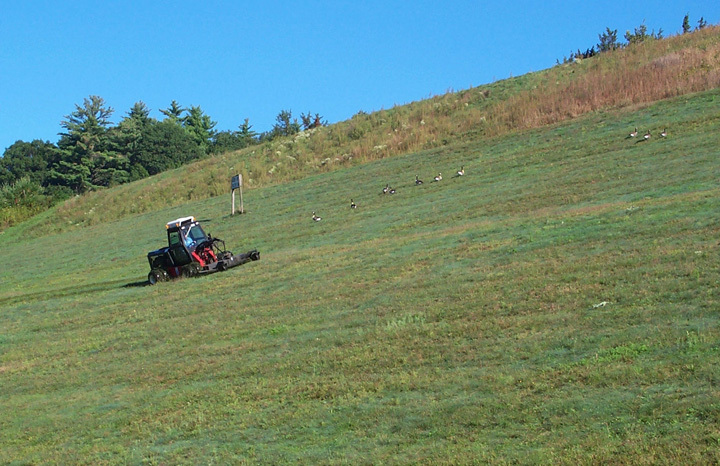 MDC employee Chris Zern mows the Saville Dam in Barkhamsted and five other dams owned by the MDC. Given the difficulty of mowing the dam during these years it is not surprising that the MDC employees came up with an innovative idea. Why not try out some four-legged "mowers"? During the 1970's an experiment was tried using goats belonging to an MDC employee. A portion of the steep section of Saville Dam was fenced in and the goats were turned out to hopefully eat the grass and keep it in good order. The test was not successful because the goats wouldn't fully cooperate. They did eat some grass, but they tended to eat only the grass near the fence, while the grass in other areas in the pen grew tall. The four-legged mowers were fired and the MDC returned to the gas-powered version. The smaller Kut-Kwik mower is used on the top section of the Saville Dam. In this photo the mower deck is actually off the ground for a short moment (due to the steep slope) as Chris prepares to back down and repeat another diagonal cut. 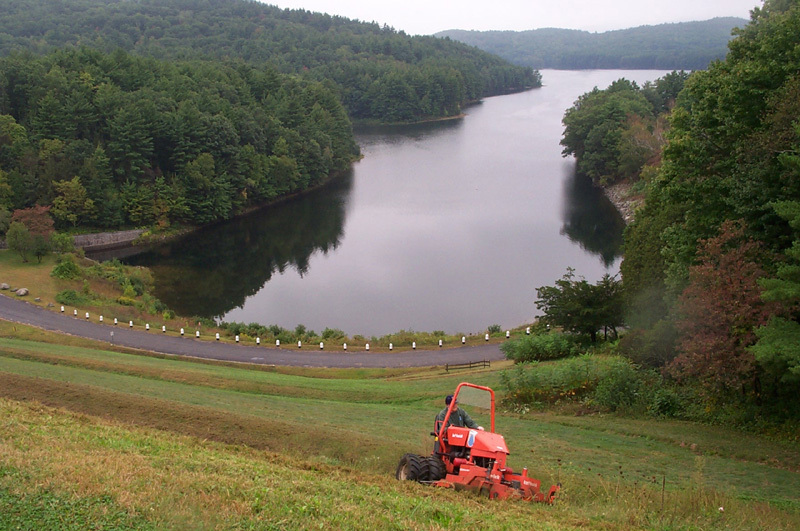 Mowing the top section of the Saville Dam with some nice scenery (Lake McDonough) in the background. This summer the Department of Environmental Protection (D.E.P.) discovered a virtual "gold mine" in 10 long overlooked paintings hanging on the walls and stored in the attic of their Pleasant Valley field office in Barkhamsted! It all began with a phone call from the James Michener Art Museum in Doylestown, Pennsylvania, where they were planning a major Harry Leith-Ross retrospective art show. A small mention in one of Leith-Ross' scrapbooks describing a series of forest landscapes he was commissioned to paint in 1934 for the Connecticut Forestry Department had started the museum searching. The paintings and the hand-carved chestnut frames that surround them, done by Richard Perry, were part of a federal Civil Works Administration project, one of President Franklin D. Roosevelt's New Deal programs during the Great Depression. The paintings were easily found, many still hanging on the walls of the office, covered with 75 years of dirt, grime and cigarette smoke and still looking pretty good in spite of it. Since they are now worth much more than the $244 Leith-Ross was paid in 1934 to paint them, they have been taken to the William Benton Museum of Art on the Storrs campus of the University of Connecticut for safe keeping and display. A professional appraisal will be done soon, but estimates range to $250,000 or more. So who was Harry Leith-Ross anyway? He was born in 1886 in the former British colony of Mauritius, an island off the southeastern coast of Africa, and grew up in Scotland and England. He came to the United States in 1903 at the invitation of one of his uncles. After studying in Paris, London and America, he worked in commercial art and advertising. In 1913 he quit advertising and attended the Art Students League summer school in Woodstock, New York. Harry Leith-Ross worked primarily in oils and watercolors. He taught classes in landscape painting in Woodstock and in Rockport and Gloucester Massachusetts. While attending the Art Students League, he first heard of the New Hope Pennsylvania art community and visited there in the summer of 1914. He returned often to visit artist friends, especially John F. Folinsbee whom he met while they were students at Woodstock. This New Hope art community was home to a group of painters known as the Pennsylvania Impressionists; in recent years prices for their works have been increasing in galleries in New York. Leith-Ross settled permanently in New Hope in 1935 when he temporarily took over teaching duties for his friend John F. Folinsbee who was summering in Maine. 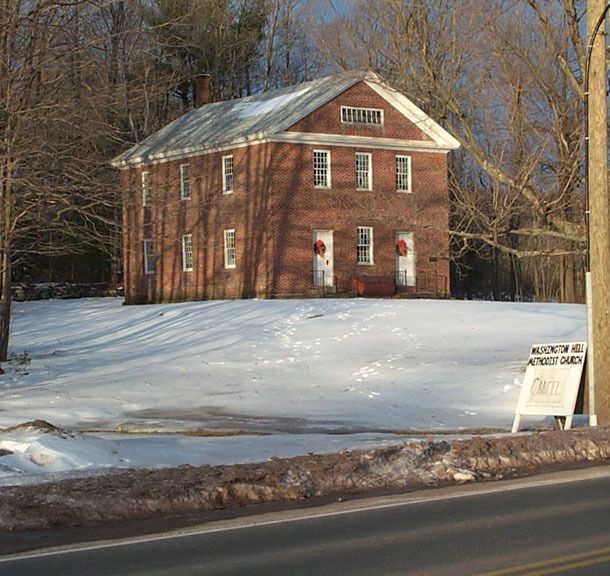 Harry and his wife Emily lived in the Jericho Valley area of Solebury, near New Hope. During his career Leith-Ross won many awards for his works from the Pennsylvania Academy of Fine Arts, Phillip's Mill, the National Academy of Design, the American Watercolor Society, the Salmagundi Club and others, and wrote "The Landscape Painter's Manual" in 1956. 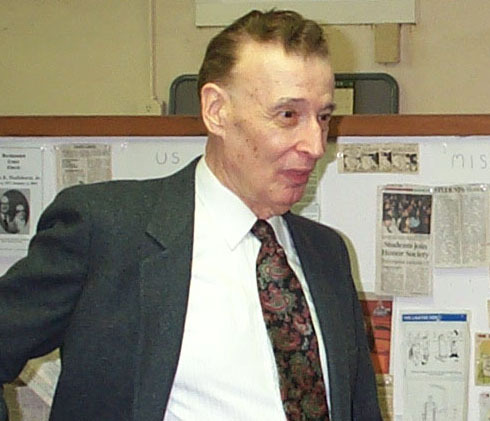 Harry Leith-Ross died in 1973 in Pineville, Pennsylvania. During Leith-Ross' time here in Barkhamsted, our own Doug Roberts was a bicycle riding youngster who struck up an acquaintance with the painter. Doug saw him at work and knew where the artist had a studio in People's Forest (the studio was located in the "Skinner cottage" which is still standing near the Farmington River at the main area of People's Forest). Leith-Ross painted all of the commissioned paintings between January and March of 1934. During this time he apparently lived in Litchfield, Connecticut. 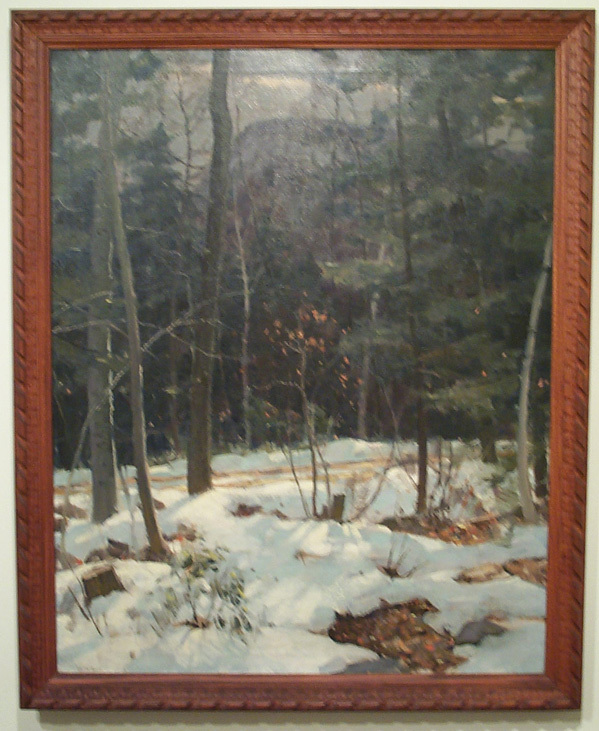 At least two of the paintings were of locations in Barkhamsted: The Big Spring Road and The River Road, both in People's Forest. 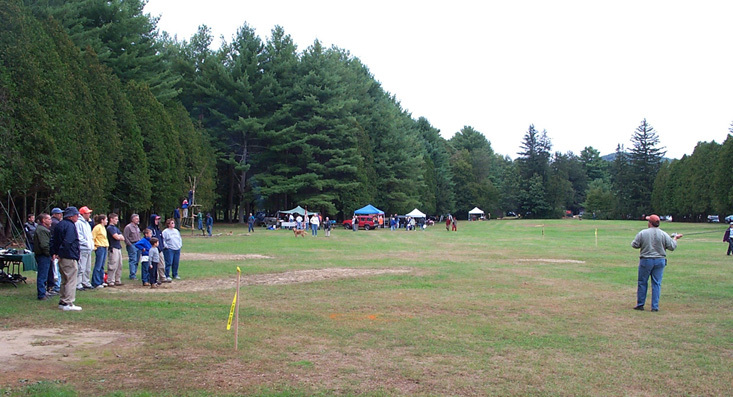 The paintings that included people (e.g., Log Team and Tractor and Saw) were thought to have been done in Paugnut State Forest where there was a CCC camp near Burr Pond. Correspondence to and from Leith-Ross during this time indicates that he traveled to Paugnut to paint. These letters, nineteen in total, were found in local DEP archives and preserved by DEP employees Walt Landgraf and Marilyn Aarrestad. The letters provide further details of the artist's time spent in this area. 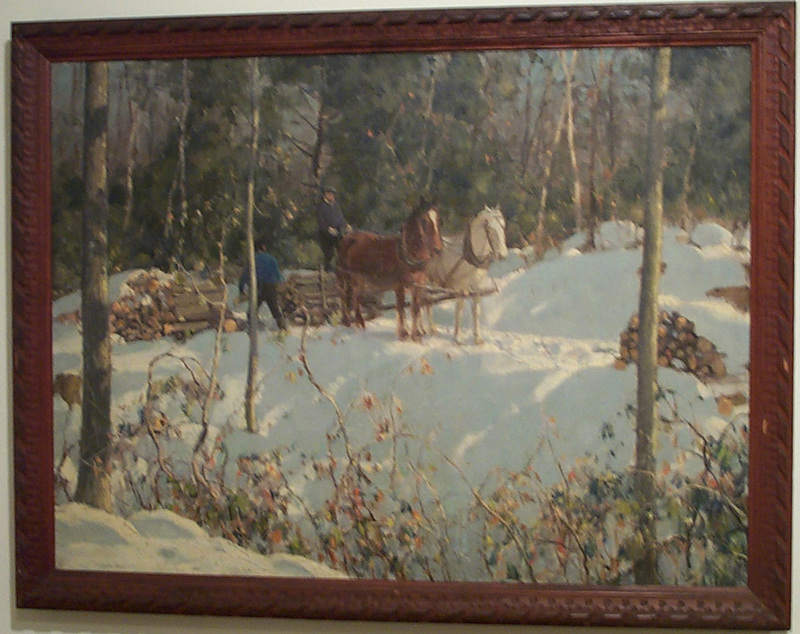 One letter, not by Leith-Ross but from the People's Forest Ranger to his boss in Hartford, said "Mr. Leith-Ross has another good sized one (painting) which is about 18 x 24. He considers this last one about the best of the group...". This reference was to the painting entitled The Big Spring Road which apparently Leith-Ross highly regarded. Keep your eyes open as you travel through Barkhamsted; some believe there are twelve Leith-Ross paintings that were done in this area. If true, that means two have yet to be found! 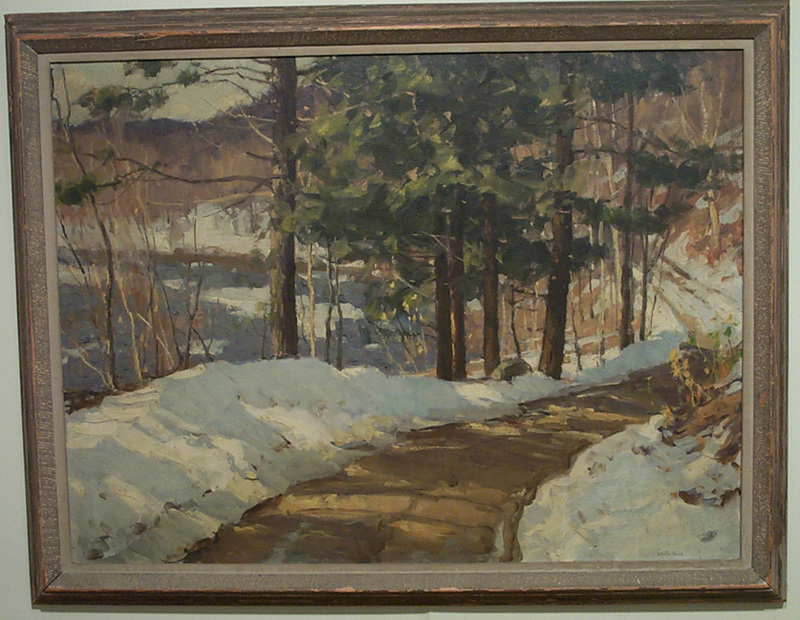 Above- The River Road was painted by Harry Leith-Ross in Barkhamsted on East River Road. 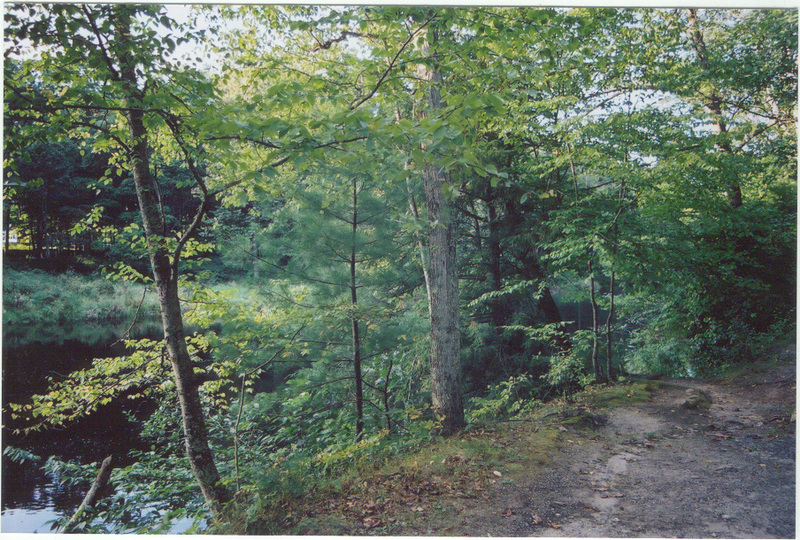 Above- An August 2003 photo showing the Farmington River (through the trees at left) near East River Road. This location is in Barkhamsted between Riverton and Pleasant Valley and is thought to be near the site where Leith-Ross painted The River Road. Above- The Big Spring Road was also a scene in Barkhamsted, in Peoples Forest on what is now called Greenwoods Road. 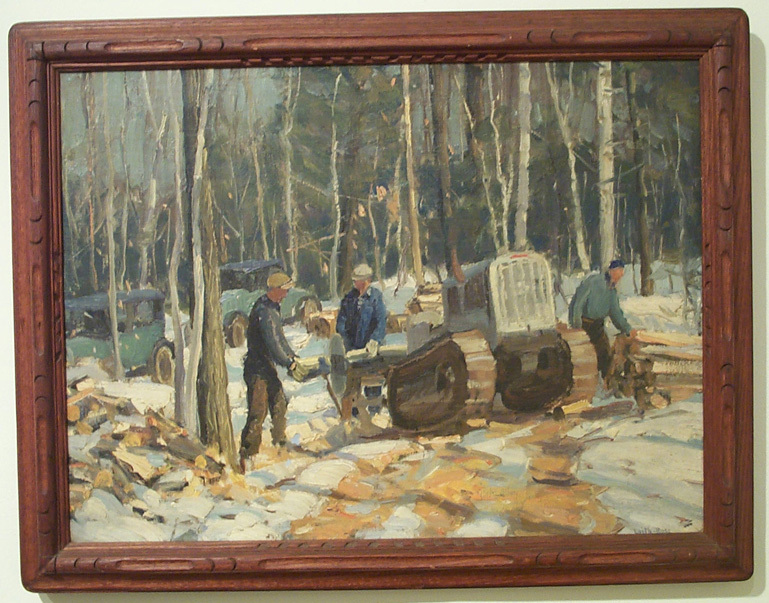 Above- Log Team is thought to depict a scene with Civilian Conservation Corps (CCC) workers in Paugnut State Forest, probably near Burr Pond in Torrington. A CCC camp was located there and was in operation during the time Leith-Ross did these paintings. 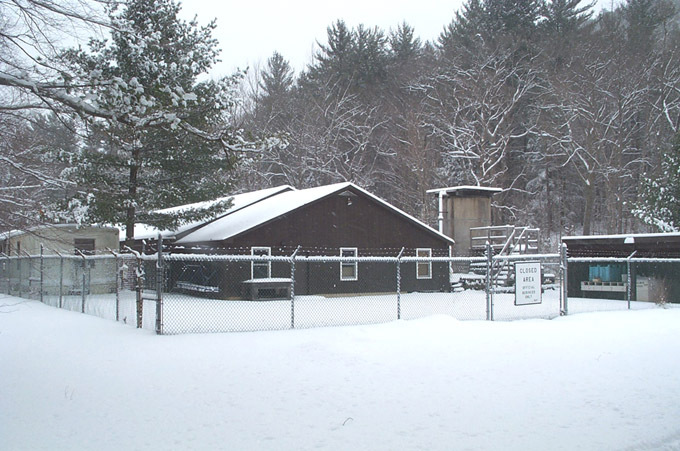 The CCC camp in Barkhamsted (Camp White) was not up and running at this time. Above- This work, Tractor and Saw, was also probably painted in Paugnut State Forest. This photo clearly shows the carved frames made out of chestnut wood. All the frames for the Leith-Ross paintings were also contracted out as a Civil Works Administration project. 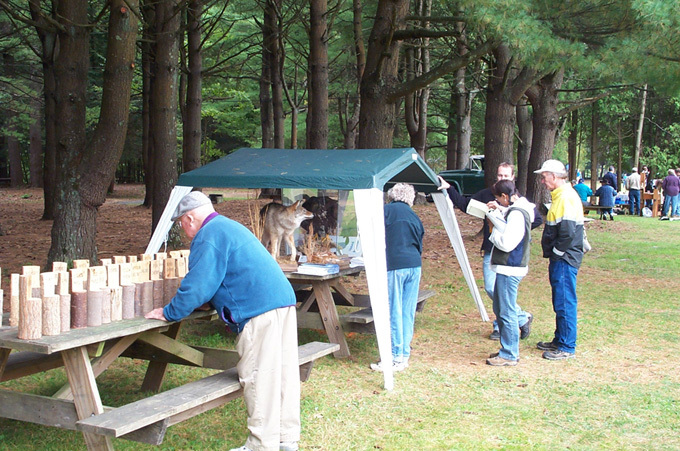 They were hand carved by Barkhamsted resident Richard Perry who lived in the Squire's Tavern building and was the father of Allan Perry, the first ranger at People's Forest. You can can't help but notice them driving along the Farmington River in Pleasant Valley during the spring and summer months. Right there, on Route 181 next to the drive-in movie screen, a large field of wild flowers splashes color across the landscape. All but the most harried, tunnel vision drivers slow down and take in the wonderful display. This beautiful sight is the work of Sylvia Lovely who owns the field and planted the wildflowers several years ago. The wildflower field along Route 181 in Pleasant Valley on July 26, 2003. Vegetables (especially corn) were grown in the field in years past, but Sylvia did not want to continue growing vegetables and wondered how flowers would look on the spot. 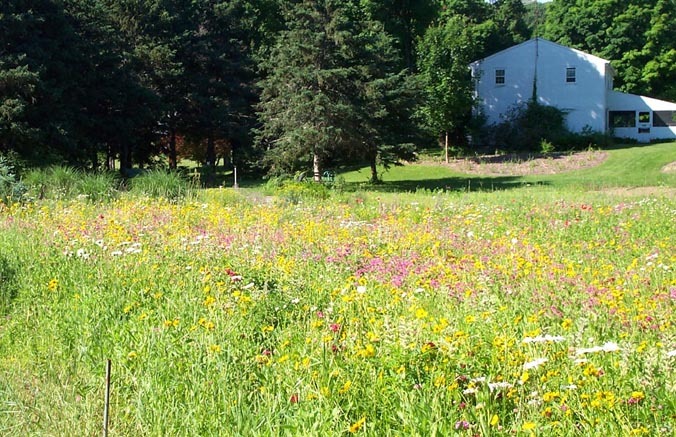 Her son Chris had experimented with a small plot of wildflowers on his land. Sylvia gave it a try also, planting wildflower seeds on a small piece of her property. In both cases, the results looked promising so she decided to plant the large field. 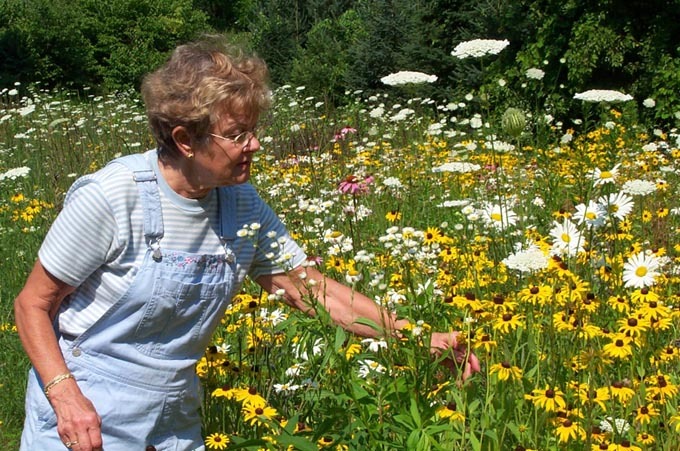 In the year 2000 she ordered a variety of wildflower seeds from Specialty Garden Supply in Colorado Springs. They sent her the "Northeast Blend" of wildflowers. 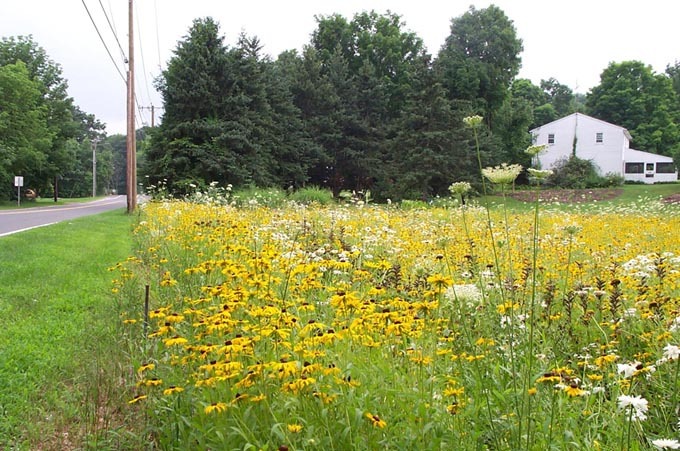 The perennial/annual seed mix included over 13 different flowers (listed below). After rototilling the field, the seeds were broadcast along with some sand to help prevent them from blowing all over. From that original sowing in 2000 the flowers come to life each year. Most are perennials, but many of the annuals also return by self-sowing after the field is mowed in late September or early October. Sylvia Lovely in the wildflower field near her home. This photo was taken July 26- the Shasta daisies and Black-eyed Susan predominate, with a few Purple Coneflowers (a butterfly favorite) also visible. 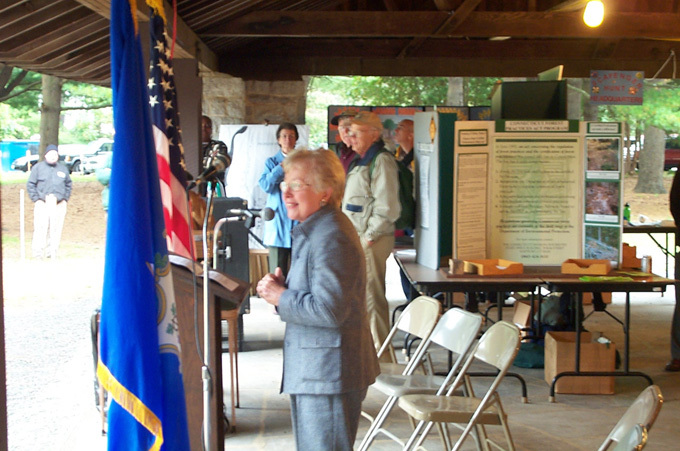 In addition to the wildflowers, Sylvia also put in over 1,800 daffodil bulbs. These were planted over a period of three years starting in 2000. In the spring, after the daffodils have come and gone, the wildflowers make their appearance. The purple and blue Lupines are first. Sylvia enjoys seeing the different flowers appear, spread their glory and then fade from the scene to be replaced by other varieties. And right next to the wildflower field, her daughter and son-in-law put in a beautiful herb garden. Pleasant Valley residents and all who pass by on the busy road are treated to some wonderful sights at the Lovely estate! The wildflower field in early July. 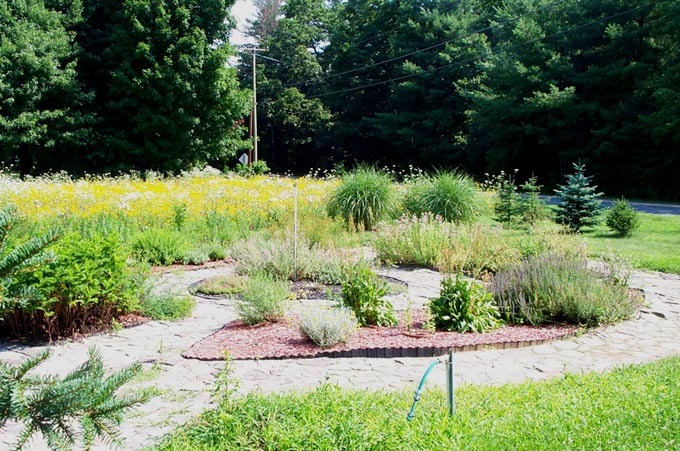 The herb garden adjacent to the wildflower field.